Gurinder Chadha's much talked-about new film Partition: 1947 has been banned in Pakistan, the 48-year-old filmmaker confirmed in a tweet on Sunday. "It is unfortunate my film has been banned in Pakistan. It will always be the land of my ancestors," the Bend It Like Beckham director wrote on Twitter. "Partition: 1947" along with the phrase "banned in Pakistan," have been featuring on Twitter's top trends since Sunday with netizens incessantly reacting to the ban. "Pakistan, why would you ban Partition 1947 to play at your theatre?" asked a tweet while another read: "Banned in Pakistan why? Partition 1947 is a great film." Partition: 1947 is the Hindi version of Gurinder Chadha's Viceroy's House, which arrived in Indian theatres on Friday. Set during Partition, the movie is an onscreen adaptation of the life of the last Viceroy of India under British rule - Lord Mountbatten. A section of Twitter appeared taken aback with the news and rooted for Partition: 1947 saying: "Partition: 1947 is an awesome film". "Where is 'art should cross its boundaries gang'?" enquired another tweet. Seriously?#BannedInPakistan but why?!? Partition 1947 is an awesome film. @RelianceEnt plz confirm this! Partition: 1947 stars Huma Qureshi along with a cast comprising names like Manish Dayal, Hugh Bonneville, Gillian Anderson and Michael Gambon. 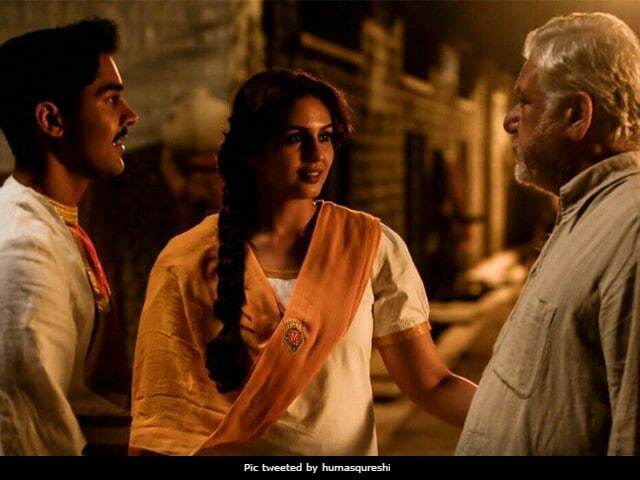 In his review for NDTV, Saibal Chatterjee writes: "Director and co-writer Gurinder Chadha embeds a fictionalized Hindu-Muslim love story in her faux-historical pastiche about the Partition of India and its horrific fallout. The result isn't salutary." Previously, resistance has been faced by several Indian films to make its way to the theatres in Pakistani. Salman Khan's 2015 movie Bajrangi Bhaijaan released in Pakistan only after additional cuts but stormed the box office in not time. Tubelight, Salman's 2017 Eid offering, also did not make it to the neighbouring country this year. The Pakistani Censor Board has also objected to movies like Akahsy Kumar films like Baby and Holiday, action-thriller Dhishoom, sports drama Lahore, Bejoy Nambiar's David, Farhan Akhtar's Bhaag Milkha Bhaag, Sai Ali Khan's Agent Vinod and Vidya Balan's The Dirty Picture citing reasons like unsuitable content. On Friday, Partition: 1947 released along with films like Bareilly Ki Barfi and VIP 2: Lalkar.